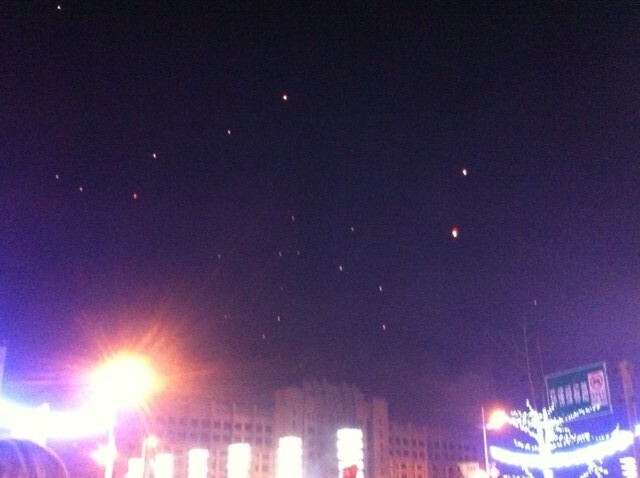 Friday was Valentine’s Day and Lantern Festival. Apparently this auspicious day happens but once every nineteen years when the dates align on the Lunar and Solar calendars. People get married, lovers go out gallivanting, kids eat sticky rice balls called Tang Yuan and Yuan Xiao, people split time between their special someone and their mom and dad, and then in the evening send paper lanterns floating into the heavens, trying to secure good fortune from their ancestors. Then, during the Qing Dynasty there’s a story about how the people of a village let lanterns fly to signal that bandits had left and the village was safe. As the years passed, traditions evolved and that’s why folks launch them still. Ah, yes. 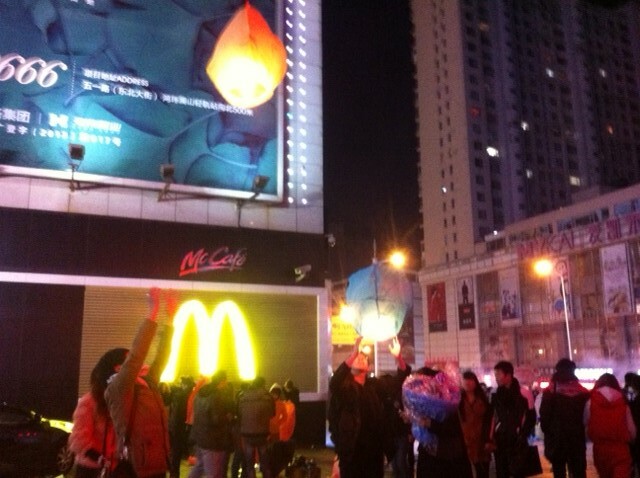 The ancient Chinese tradition of huddling around the Sacred Golden Arches and launching floating arson bombs. Ancestors, give my vengeance wings. And we all know the story of the Western holiday, Valentine’s Day, right? On a cold February 14 in Chicago back in 1929 a group of Al Capone’s men, two dressed as cops, gunned down seven of his competition’s men, in broad daylight, thus prompting card companies to adopt the color red and a Tommy-gun toting cherub in a fedora as their mascot (Chicagotribune.com, except for the cherub part…). Xiao Ming showed me some jokes that are circulating the Chinese net on this auspicious day. I’ve written before about the “Second Wives” of Chinese business men (here: https://ourchinaexperiment.wordpress.com/2013/07/19/women-wives-and-wandering-willys/ ), but I’m not the only one. 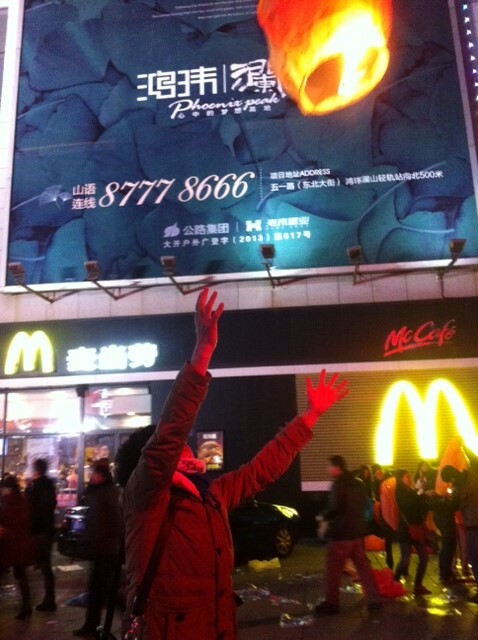 In China, Xiao Sans and their Sugar Daddies are joked about openly, or at least quasi-openly since it’s on the web. Here are two jokes, translated by Xiao Ming and me. First one: In two day, xiao sans and wives will fight for the same guy. Secrets will be revealed, roses double or triple in price, and many more people will be produced. At 4 pm managers of flower stores will smile. At 6 pm restaurant managers will smile. At 9 pm bar managers will smile. At midnight hotel managers will smile. And the next day pharmacy managers will smile. 7 am: Send text to lover while in shower. 7:30 am: Make wife breakfast. 8:00 So to store, buy 100 roses. 9:00 Give 99 roses to lover. 9:30 Back home give one rose to wife. 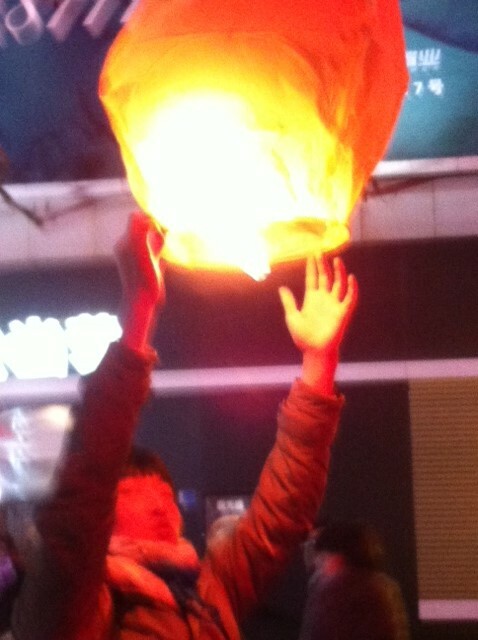 12:00 Accompany parents for lantern’s day. 17:00 Western restaurant with lover. 19:00 Take wife to a restaurant nearby home then watch movie. 22:00 Give wife a cup of water with 5 sleeping pills inside, go to bed. 0:30 Home of lover, get it on. 8:00 Next day back home, make breakfast wake up wife. Whoever you’re spending your time with, take care and have fun this weekend.